April 3rd-10th Human Rights Watch Film Festival @ TIFF Bell Lightbox, 350 King St. W. The 16th annual Human Rights Watch Film Festival, co-presented by TIFF and Human Rights Watch, features a diverse lineup celebrating the power individuals can hold in complex social and political situations. April 3rd-June 2nd HideSeek @ 1305 Dundas St. W. An immersive pop-up experience inspired by childhood nostalgia. With floor-to-ceiling installations designed to help rediscover playful activities, HideSeek brings childlike wonder to life and fulfills the universal dream of adulthood: to feel like a kid again. $25 (plus taxes/fees) advance tickets available online. April 4th-6th Mass Exodus @ Daniels Spectrum, 585 Dundas St. E. Explore various forms of art and design executed by graduating fashion students from the School of Fashion at Ryerson University. The two components of Mass Exodus 2019, Installation and Runway, will focus on the progression and growth that occurs in the natural world. The student work of Fashion Communication capstones and Fashion Design collections will illustrate the shift from a cold reality to a bright future—where change is able to exist indefinitely. April 5th-7th Neo Waistland @ 227 Sterling Rd., Unit #109-A. A three-day contemporary pop up shop bringing forth revolutionary thoughts and creations, and offering an exclusive experience of local fashion, music, art, and food. RSVP here. 9 pm Boosie Fade Film Club Presents: ATL @ TIFF Bell Lightbox, 350 King St. W. 13 years after its premiere, Boosie Fade Film Club is proud to present Chris Robinson’s 2006 film, ATL. $14 tickets available online. 10 pm Psychedelic Soul Shack @ Swan Dive, 1631 Dundas St. W. DJ D.B. Bux plays the best soul, funk, disco, and psych tracks all night long. 10 pm Boosie Fade @ The Shop, 1566 Queen St. W. The rumours are true: Boosie Fade is back in its natural home at The Shop, under what used to be Parts & Labour. The boys of Boosie Fade will be behind the decks spinning the latest and greatest in hip-hop, including tunes from artists like: Dababy, Tierra Whack, City Girls, Cardi B, Young Thug, Gunna, Lil Baby, Travis Scott, Beyoncé, and more. $10. 10 pm Night Waves @ The Red Light, 1185 Dundas St. W. DJs Alister Johnson and Sonny Dunn bring you a night of ’80s boogie, funk, and soul with records that helped shape music as we know it today. 10 pm Beam Me Up Disco @ The Drake Hotel, 1150 Queen St. W. Beam Me Up kicks off its new Friday night residency at The Drake! A disco jam that celebrates the underrated and the obscure of funk, jazz, soul, boogie, rare groove, reggae, gospel, proto-house! It’s an evening of tuneful transcendence, supplied by residents Patchouli Brothers and Cyclist. 10 pm Rhythm & Booze @ Stones Place, 1255 Queen St. W. R&B, soul, funk, and disco from the ’60s to ’00s with DJ Blush. $5. 10 pm NiteBeat @ Bambi’s, 1265 Dundas St. W. Once again, the sun sets, the moons rise, the NITE begins, and the bears come out. Some say you should not feed them. But they are hungry once again. Come and leave a treat, no, come leave a sacrifice: your soul and sweat will do. Ali Black and Andycapp on the decks. 10 pm Disco Fridays @ The Piston, 937 Bloor St. W. Hear a delightful array of disco and its sub genres every Friday at The Piston. $10. 10:30 pm Baewatch: A Queer Beach Party @ Miss Thing’s, 1279 Queen St. W. HER Toronto presents the ultimate queer beach party (without the beach). Global DJ, rapper, producer, and party queen Chippy Nonstop will throw down a FIYA mix of electronic, dance, and world music while Toronto’s own Valeria Vendetta will ensure the party stays litty with her selectively curated trap and hip-hop tracks. Beach looks highly encouraged. $10-15 advance tickets available online. 11 pm Ruffles @ SoSo Food Club, 1166 Dundas St. W. A spring vibe ruffling around with DJs Young Teesh, Kristie Muller, and special guest UNIIQU3. $11-16 advance tickets available online. 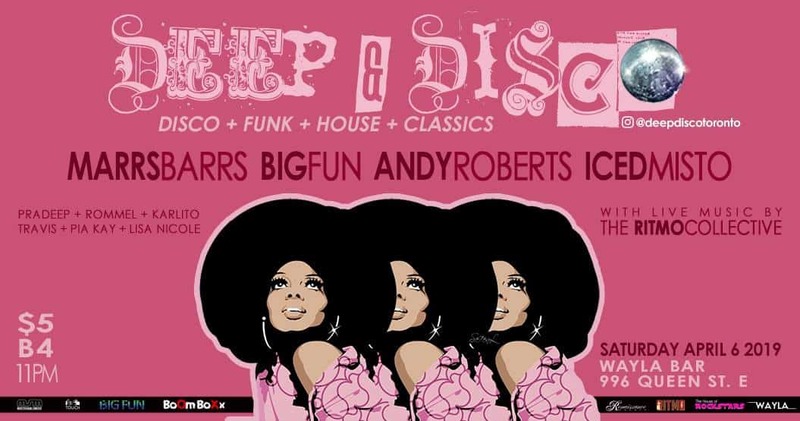 9 pm Deep&Disco @ WAYLA Bar, 996 Queen St. E. Disco, funk, and house music played by DJs Marrs Barrs, Big Fun (Joe Navarro and Chico U), Andy Roberts, and Iced Misto + a live performance by Ritmo Collective. $5 before 11 pm, $10 after. 10 pm The Strokes Dance Party @ Sneaky Dee’s, 431 College St. Dust off that leather jacket and mess up your hair, it’s time to party like the cool kids at Sneaky Dee’s The Strokes Dance Party! They’ll be playing dance rock tracks to take you back to those hazy neon nights behind the bar back in 2010. $5 advance tickets available online. 10 pm With It @ The Piston, 937 Bloor St. W. ’60s mod, soul, R&B, R&R, garage, beat, surf, and funk record dance party with DJ Nico + special guest DJ Chico. Sponsored by Kops Records. $10. 10 pm Queer Slowdance: Prom Edition @ Dovercourt House, 805 Dovercourt Rd. With a lending library of designated dancers for all the wallflowers, and a dance card-booklet to set up dances in advance (should you choose to), Toronto Queer Slowdance has all slow songs, all night long! (Except for the occasional intermission when they play the fastest songs they can find.) Fabulous and inspired attire, while desired, is not required, but since this is the Prom Edition, it’s a great chance to wear the duds you don’t have the opportunity to wear anywhere else! $10. 10 pm The Groove @ Swan Dive, 1631 Dundas St. W. DJ Brother Wayne plays Motown, soul, pop, and rock. Come get your groove on! 10 pm Chronologic @ The Garrison, 1197 Dundas St. W.C A dance party through the ages. Pop and anti-pop from since the end of history (i.e. music from 1890 to 2019, played in chronological order). $5 before 11:30 pm, $10 after. 10 pm Sophisticated Funk @ Farside, 600 Gerrard St. E. Joining the musical dots – soul, hip-hop, house, latin, electronica, jazz, and beyond on vinyl. 10 pm PPParty @ The Boat, 158 Augusta Ave. Why all the the P? ’Cuz this party is golden! 24 Karat hits from all decades. 11 pm Star69 @ SoSo Food Club, 1166 Dundas St. W. “The sense a listener may have, when listening to audio, that an originating moment––a duration––transfers into the present from another time is a function of our imagination, not a property of technology.” Incognito grooves from operators Yohei Saka, Kees Kees, and Kaspr. $5 before midnight, $10 after. 11 am Toronto Art Crawl Spring Pop Up @ The Great Hall, 1087 Queen St. W. Shop directly from the hands of 60 local artists and designers. Choose from original art, fashion, jewelry, home decor, vintage, photography, body care, interactive demos, and more. Free swag bags for the first 25 attendees! $8 in advance, $10 at the door (kids under 10 are free). 8 pm Nite Comfort @ Handlebar, 159 Augusta Ave. The ongoing search for genre-defying, boundary-pushing music, and other hidden gems in the heart of the city. This episode is going to be a dream for synth lovers! This episode brings an exciting visit from Montréalers Syngja, and a beautiful new ambient percussion/concrete project from Robin Buckley and Jakob Thiesen, Spectral Tambours. PWYC.